This article first appeared on East Niagara Post on December 23, 2014. It is repeated here as I work to put all my book reviews in one place. They will be posted on Thursdays or Fridays and only be altered from the original in that I will add publisher information and pages. Hopefully, by revisiting these reviews, other people might find a book they'd like to pick up for their own enjoyment. The following is a satirical review of a book. It is meant to be humorous and to pique your interest in picking up the book to read. Most of what you read is meant to be funny, although I will end the review on the serious side. Writing a review for a nonfiction book is very difficult. The reviewer needs to be well-versed in the particulars of the subject in order to write a competent review, unless the reviewer is critiquing only the writing style and flow. It becomes especially difficult when reviewing an autobiography. Who knows better than that person about their own life? The only people able to refute the stories are the other eyewitnesses. That’s probably why so many of these works are written so late in life -- no one to dispute the facts. And rock stars likely have the clearest memories of their own lives. What did I learn from reading Paul Stanley’s Face the Music? I learned that Paul single-handedly, along with Gene Simmons, saved rock and roll. Without him, and Gene Simmons, rock music would be dead and we would be forced to listen to duets of k.d. lang and Eminem. We owe Paul Stanley (and Gene Simmons) a great deal of gratitude for their pure genius. P.P.P.S The Gene Simmons joke got old really fast, so I will not be mentioning Gene Simmons again unless the narrative requires that I mention Gene Simmons. 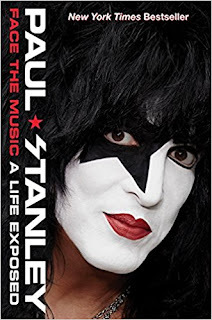 After reading this book, I learned that The Starchild and The Demon were responsible for all of KISS’s success. They were the creative force behind the band. The Catman and Spaceman were free to be creative as long as they fit into the confines of what Stanley and Simmons wanted. To break out of that box meant that the artist was subject to Paul Stanley taking credit for the good stuff and ridicule for the songs not up to snuff. Take the song “Beth” for example. Peter Criss brought this song to the band and is credited as a co-writer with Stan Penridge. According to Paul Stanley, even though the song was written before Criss even joined the band, if it weren’t for him, the song would never have been finished and recorded. These guys want to take credit for everything great. And who could blame them, Paul Stanley and Gene Simmons are the face of KISS, even if those faces are covered with makeup. I never realized that KISS was so important to rock music that they could dictate to headlining acts on the tour exactly how KISS was going to use said headliner’s stage. KISS roadies with a switchblade will help clear up the misconception that the headliners have any say in how their stage is utilized. Besides, they’re not in the business to make friends. They’re in the business to make the best music possible in two-chord, three minute increments. In all seriousness, I love to read memoirs, especially of those in the entertainment business. These people are some of the most creative people in the world. I am always eager to learn the process they go through to deliver their product. Paul Stanley is one of the most well known artists in the rock world. Whether you like their music or not, you have to appreciate that KISS has persevered through decades of a finicky record-buying public. What I truly learned was that a successful and lucrative career does not guarantee happiness. Paul Stanley, while displaying his tremendous ego while on stage and in the recording studio, is often insecure about himself when he’s not Starchild. He struggles with the fame that accompanies being in KISS. Paul Stanley is obviously a very talented songwriter, musician and writer. His autobiography is easy to read. It’s fun to look behind the makeup and learn about the man. To be fair, the reader must get beyond some very flagrant egotism to get to the story, but that’s his prerogative. He’s earned the right to be smug. Besides, he’s trying to sell himself, and don’t we all embellish our past just a little to make our own legends seem a little greater in the telling? Stanley shows that he is just like the rest of us. The narrative flows with ease and the reader is pulled backstage for the formation of one of the most popular bands. I enjoyed this book immensely. Obviously KISS fans probably have already read this book. Even if you’re not a fan of the band, this book will hold your attention. Not only do you get a peek at KISS, but also their interactions with other popular acts like Aerosmith and Guns N Roses. You can read how Paul Stanley really feels about Slash. We all love dirty laundry, which is likely why these books sell so well. We want all that and the groupie stories. We simply wish sometimes we could be them for just one day. Reading Face the Music gives us just a moment to dream a little bit more.